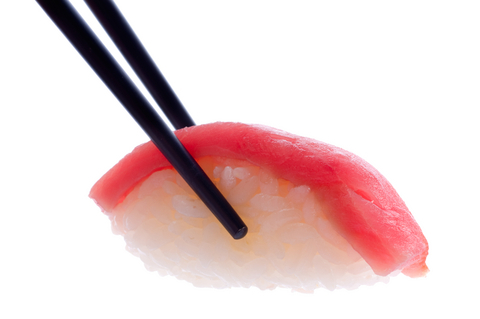 Many people confuse nigiri zushi with sashimi or osashimi. osashimi is actually the fresh sliced fish used to make sushi. Where to find good source of sushi grade fish? It's usually found at a Japanese or asian markets in large cities. Nigiri zushi is pure sushi. Its the most sought, most expensive and elusive of sushi. Its pure sushi because on the menu in Japan for nigiri zushi with tuna as the topping it would typically read simply Tuna or Maguro. For shrimp topping: Shrimp, for egg: Egg, for salmon: Salmon, etc. Thats it. No Tuna Nigiri or Tuna Zushi. If it was a tuna roll it would specify on the menu as Tuna Roll or Maguro Maki. Notice the suffix -roll or -maki added. Sushi chefs spend years practicing day in and day out to perfect the art of making the nigiri sushi recipe, usually raw fish over an oval of sushi rice. Why something so simple is difficult to master? The difficult part is getting the right amount of rice and topping. Also, it needs to hold together when picked up with chop sticks not fall apart. The wasabi has to be right so as to not drown out the flavor of the topping and rice. Then make it quick enough so the warmth of the hands minimally transfer to the fish topping. Its tricky, even for a do it yourself home-cook in Japan. At home, there are no critics visiting your dining room so you can practice making it in the privacy of your home. 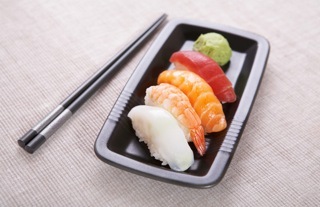 You can make it to suit your own taste using the guide lines from this Sushi Recipe website. Then share it with your family and friends. There is a varying amount of difference between the master chef's work and the home sushi chef's nigiri sushi. The home sushi chef spends a little more time to form the piece. So no worries because you are not feeding 16 bar stools or 30 tables. Relax lets make this in your kitchen...the easy way. Nigiri sushi recipe is simply seasoned sushi rice with fresh topping ingredients smeared with a bit of wasabi. 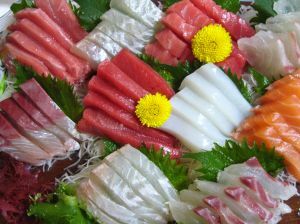 The toppings can be raw fish, cooked shrimp, unagi, omelet, or just about anything that will compliment the sushi rice.